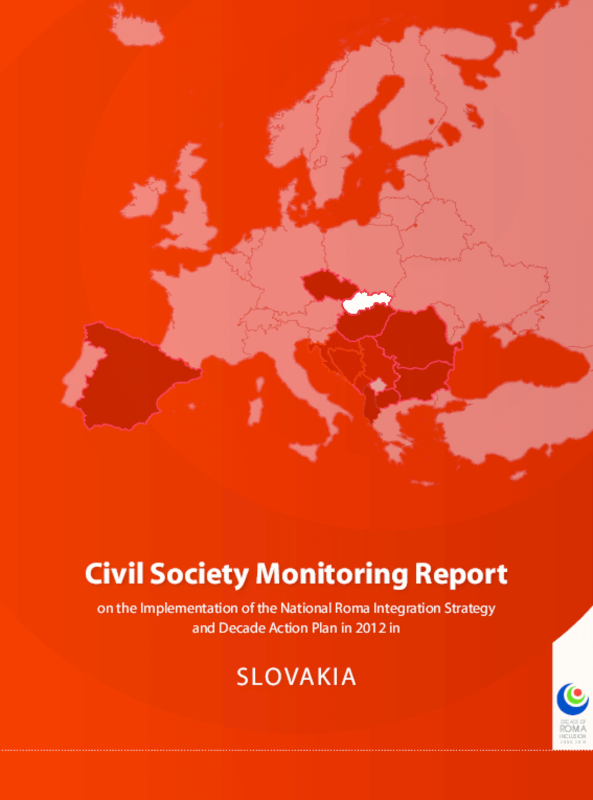 This civil society monitoring report critically assesses policy developments relevant for the implementation of the Revised National Action Plan of the Decade of Roma Inclusion for 2011-2015 adopted by the Slovak Government in 2011 (Revised Action Plan) and the Strategy of the Slovak Republic for Integration of Roma until 2020 (NRIS) approved in January 2012. We focus on the monitoring period commencing with the adoption of the Revised Action Plan in August 2011 until March 2013. Where necessary, we have included policy development prior to the reporting period. The report is based on a data set and information gathered through desk research, information requests directed to the relevant agencies and interviews with public officials, including mayors, and NGOs. In addition, we have prepared case studies of five policies to assess the impact of key flagship policies on the ground: Individual integration in education, activation works, municipal firms, Roma health mediators and the programme of lower-standard housing. The cases studies draw on desk research complemented with qualitative empirical research in four localities in eastern and central Slovakia. The report finds that the implementation of NRIS and Revised Action Plan greatly suffered from administrative and personal changes brought by the early parliamentary elections in March 2012. Both documents were prepared by the previous administration. The incumbent high ranking officials including the newly appointed Government Plenipotentiary for Romani Communities (GPRC), Peter Pollák, have made no statements suggesting their solid support for these policies. We have seen, for instance, no palpable progress in ensuring sustainable budgetary commitments to the implementation of the Revised Action Plan and the NRIS. Instead, Pollák has introduced principles of the so-called "Roma Reform -- the Right Way" ("Rómska Reforma -- Správna Cesta"). The reform proposal that is in many ways discriminatory is based on the enforcement of a desired behaviour under the threat of sanctions. This principle is in a dire conflict with the NRIS.